There were two untimely setbacks in one week, with the latest coming Thursday when nearly 200 passengers had to evacuate a train after seeing smoke spew from the back. 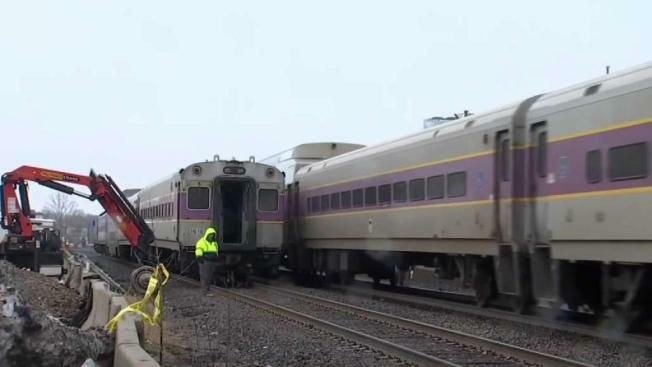 A fire aboard an MBTA commuter rail engine on Thursday morning caused severe delays. Train 036, which is on the Kingston line, was delayed heading to South Station after the train's turbocharger engine experienced a mechanical problem that sparked a fire near the Hanson Commuter Rail Station on Main Street. Keolis' MBTA Commuter Rail Twitter account initially said Thursday's delays on the Kingston line were due to a disabled train, and then said the train was experiencing a mechanical issue. Hanson police say firefighters responded to a report of a fire in the train's engine at the train station just before 7 a.m., and that the fire was promptly put out. Cell phone video captured the smoke that forced the passengers to evacuate and wait for another train. Hanson fire officials said there were about 175 passengers on board at the time of the fire, and that it took about 45 minutes to get everyone off of the train. Keolis says passengers between Whitman and South Station were accommodated by an extra train running on Train 036's schedule. The company also worked on alternative service plans for passengers, according to a spokesperson. By the time their train pulled into South Station, though, commuters like Dan McGrath were hours behind schedule and reeling from the ride that took them there. Aerial footage from NBC10 Boston's Sky Ranger helicopter showed passengers walking along the tracks in the cold to get to their new train. Some of those passengers took to Twitter to express their frustration on Thursday morning. "Well the Kingston Plymouth commuter train engine just blew up in Hanson," said Mark Diethelm. "Evacuated the cars closest to the engine. Now waiting for Fire dept to put engine fire out." "once again, beautiful fall morning... train 20 minutes late and counting, train 36 Kingston to s station," said Michael Atrata. "Can we get some folks from NASA, or even Subaru, to take over?" "Typical day on @MBTA_CR Kingston/Plymouth line," said another rider. "#3rdworldservice #1stworldprices"
"What are you going to do for the people at Kingston, Halifax and Hanson?" asked Ryan Hill. "Are you sending buses? Need to be able to provide some update to work as to when they can expect me. Some of us have to answer for things unlike @MBTA_CR"
"Fire on @MBTA_CR train at Hanson delaying everything inbound from Kingston at least 45 minutes," said Jack Sullivan. "I will not miss this farce of a system after I officially retire tomorrow. #MBTAfail"
"Everyday something busts," added Richard Dunphy. "This weekly breaking down of trains on the Plymouth/Kingston line has to stop!" said Dennis Connolly. "Late AGAIN for work!" "On the Kingston @MBTA_CR to Boston," said Art Beecher. "Stopped at Hanson w/ engine problems. Asked to 'cross our fingers.'" @MBTA_CR why does twitter know more about these Kingston delays than my conductor does...? Kingston @MBTA_CR train "terminated.". Engine on fire; Fire Department on the way.
.@MBTA_CR what's going on with the Kingston 034? Why are we late again? @MBTA_CR This weekly breaking down of trains on the Plymouth/Kingston line has to stop! Late AGAIN for work! This is the second Keolis train that has run into major trouble this week. An upright derailment caused major delays on the Fitchburg commuter rail line on Tuesday. “I think it’s symptomatic of a much larger problem we have in our public transit system,” said Senator Joe Boncore who chairs the Joint Committee on Transportation. Boncore says the state’s transit system has been struggling for too long. While Keolis has added thousands of trains in the last few years and improved punctuality, Boncore says significantly more investment is needed, whether broad based tax or some other avenue, in order to avoid future derailments and delays. Keolis says it is investing but that takes time. In the meantime, they are investigating what exactly caused both incidents this week.